Unless you’re Egon Spengler in Ghostbusters, I think it’s safe to say that everyone owned a rubber duck at some point in their life. This however, is not your average rubber duck. 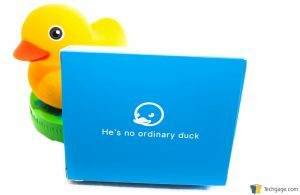 This is a Bluetooth rubber duck that is a teaching toy, companion, music player, and even a tub-time friend! Meet Edwin The Duck. Being a father, I am always on the lookout for creative ways to teach my son new things. Being 2 ½ years old, he is literally learning more and more every single day. Studies have shown that you will learn more in your first five years than you will in your entire life after that. What we are having a look at today is a rubber duck. This is probably the most recognizable toy, anywhere on Earth. But, this is no ordinary rubber duck. I first saw this duck on demonstration at CES 2016, and I was so impressed with it, and its potential, that I gave it a Best of CES 2016 award. The company that created Edwin The Duck is located in my home state, in a town not far from me: Carmel, Indiana. The company, Pi Labs, specializes in educational software. In February 2015, it was nominated for two Mira Awards in the categories of Tech Startup of the Year and Mobile Tech, winning in the Mobile Tech category. The next year, it was honored once again by winning Scale-Up Company of the Year 2016. The Mira awards recognizes excellence, innovation, entrepreneurship, and community commitment across Indiana. 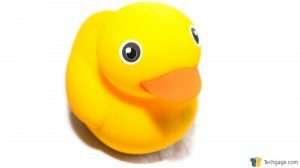 Most rubber ducks do one thing: float in the tub. That has been enough for many generations of kids the world over. 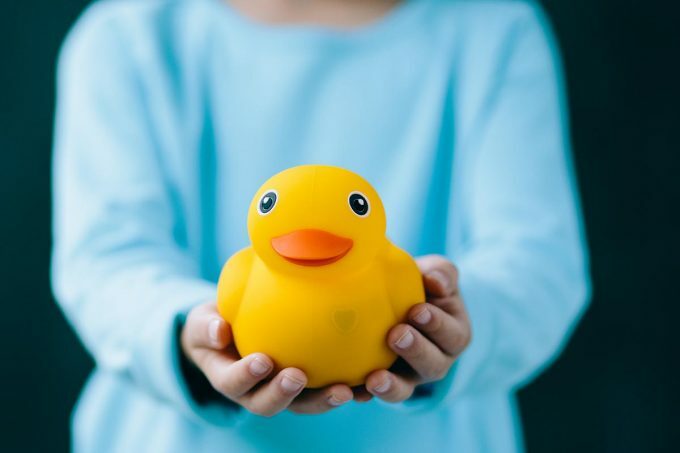 But let’s face it, in this world of app connected everything, it’s only natural for kids’ toys to follow suit, even a toy as simple as a rubber duck. 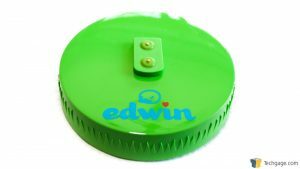 Edwin is a Bluetooth-connected, app-enabled toy for children; ages from newborn all the way to age 5. Anyone with kids knows, most toys don’t span an age range like that, not even close. Edwin is about 4 ½ inches long, 3 ¾ inches tall, and about 3 ½ inches wide. He is made of a very nice, very premium feeling silicon rubber, which is BPA free. He has one button, in the shape of a heart on his chest. This is used for turning him on, off, and pairing for Bluetooth. 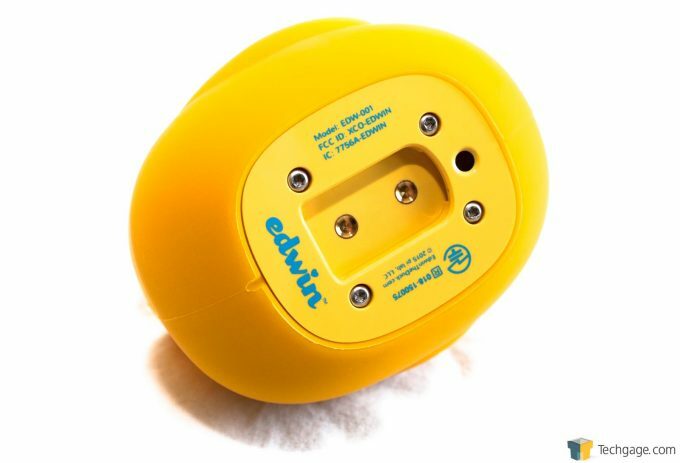 Edwin has an accelerometer, for motion-based play, an LED nightlight that lights up his head, a built-in Bluetooth speaker, and of course is waterproof and submersible. On the bottom side, we see the bottom plate which is home to the dock charging points which are gold-plated for long life. There is also a sensor on the bottom that you can use to take the temperature of the bath water to make sure it is safe, or even take your child’s temperature, just by placing it on your child’s forehead. Edwin comes with his own dock, or charging station, or “house”, as my son likes to call it. This is where Edwin recharges, and it’s powered by a supplied micro-USB charger. Edwin will continue to operate while on this dock. Edwin has three apps as of right now. 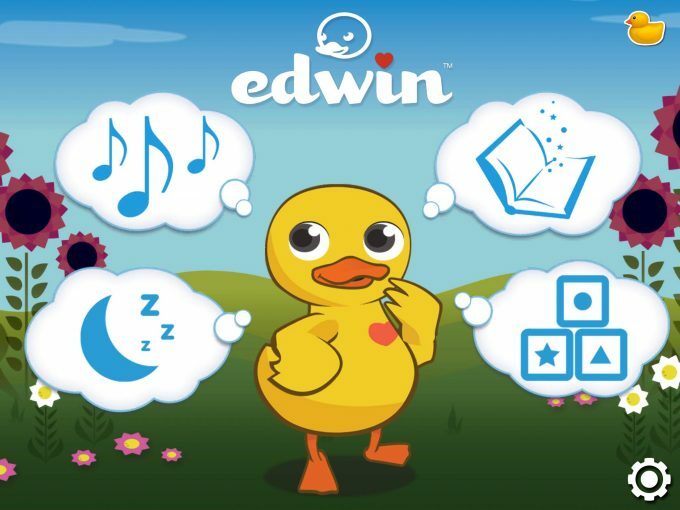 The main Edwin The Duck app is available for iOS and Android. The other two apps are currently iOS-only, but I am told they will be coming to Android shortly. These are the Sleepy Time and the Wellness Apps. 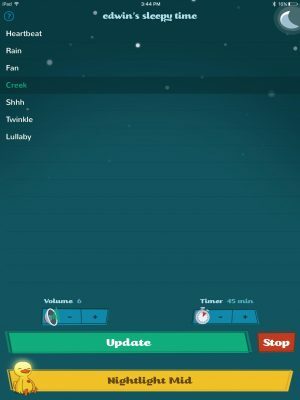 Edwin’s Sleepy Time app is for night or nap time, and you can select a number of sounds that Edwin will play. You can also select how long to play them for, and how bright to have the nightlight, or have no light at all. What is great about this feature, is the device controlling Edwin does not have to remain connected. Once you select the song, and the time, Edwin can lose connection to your device and will satisfy the last known program that you gave it. This is a very smart function, as Bluetooth doesn’t have fantastic range; I know that when people put their child to bed, they don’t want to have to worry whether or not the Bluetooth is in range! Edwin’s Wellness app utilizes the temperature sensor in the bottom. You can take your child’s temperature and it will display on the app. This app also includes wellness advice, and tips. The main app is called Edwin the Duck, and this is where the majority of the functionality resides. Within this app are sing along songs, a bed time song (the rest of the bedtime features are in the Sleepy Time app), read along stories, and games. 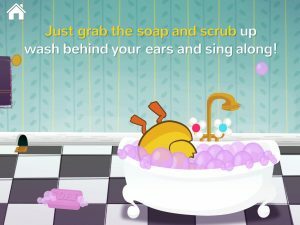 At the time that I write this, there is only one interactive song, called Squishy Squishy Squashy, and as you can imagine, this is a bath time song. You can make Edwin sing along to the song, wade back and forth in the tub, and even dive under into the water. There are currently two stories, “Edwin Feeling Small”, and “Edwin Your New Best Friend”. In these stories, you have to interact using Edwin. You may have to tap him on his left wing, or right. You may need to move him back and forth, side to side, or have him dive to advance in the stories. There are currently three interactive games for Edwin. The first is “Shapes With Edwin”. 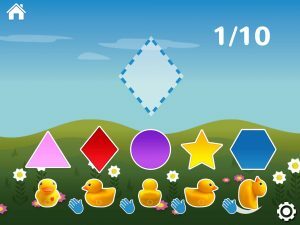 In this, you match up shapes to what the app asks for by name, and tap Edwin accordingly to select the shape. For younger users, there is another game called “Edwin’s Shape Matching”. With this, the child will need to match up the shapes to the image on the screen, and tap Edwin accordingly to match up the shapes. 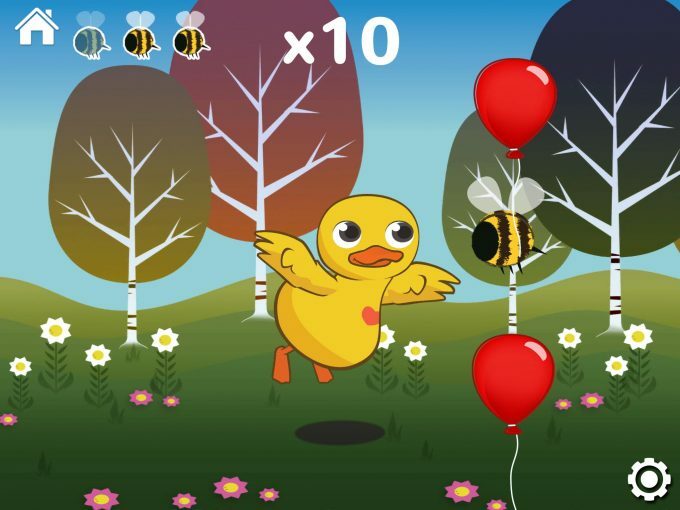 The third game is “Balloon Pop”, which is along the same lines as Flappy Birds or others, only a little less challenging to keep your child interested and engaged. 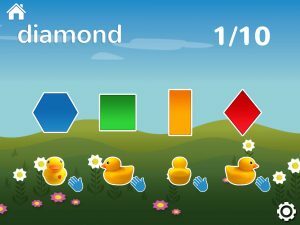 All of these games are designed for repetitive learning, and developing hand/eye coordination. This is a fantastic device, and at $99 is a great value in my opinion. 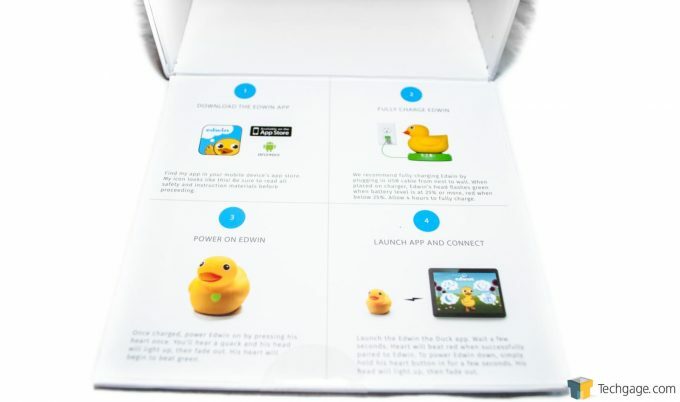 When I saw Edwin The Duck demonstrated at CES, I was completely blown away, I thought it was the neatest children’s toy I had seen in a long time. There is a lot of potential with this toy, with more content currently in development and on its way. And that brings me to Edwin’s current only weakness: content. Edwin has only been on the market for a short time, and has exploded with popularity. Pi Labs is working hard to bring more content to Edwin, which is certainly needed. This toy has limitless opportunities for advancement with DLC. The real genius here is the software. 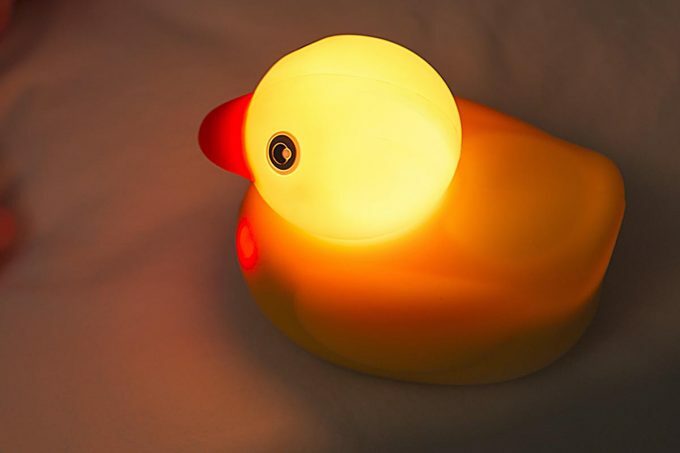 The duck itself is nothing more than a battery, a few sensors, an RGB LED, a speaker, and a covering. The software is where the magic happens, and I see a very bright future for Edwin. In my conversation with the CEO from Pi Labs, he told me of new stories coming to Edwin, including new characters, a live band called “Edwin and the Wingmen” and even possibly an animated series. 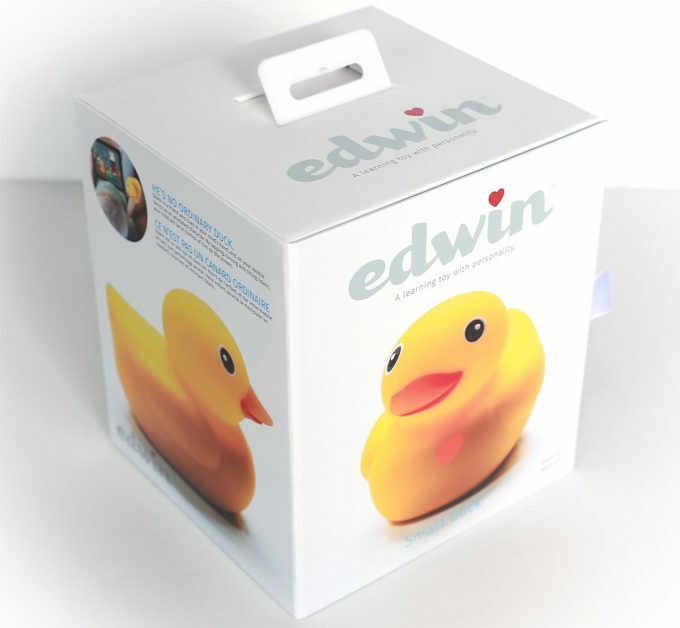 With the live band, children could bring their Edwin toys with them, and actually interact with the show, much like the interactive concert experiences at major concerts today. I only used Edwin on iOS, and I never had any issues with app stability, Bluetooth connectivity, or anything else. The battery lasts a very long time. The company claims 8 hours, and I didn’t have any issues reaching 8 hours on a single charge. Naturally, depending on how loud you have Edwin turned up, or how bright the night light is, your mileage may vary. All of the content is beautiful and really well made. All of the songs are pleasing, and performed by very talented people. One little caveat with Edwin, is he does utilize Bluetooth LE (low energy). I had our old iPad 2 in a rugged case for my son to use with other educational games, but Apple didn’t add Bluetooth LE to its devices until the iPad 3 and above. Luckily there are a plethora of good condition used iPads on eBay, and I was able to get him a 4th gen iPad pretty reasonably there. You will need to be the judge if your child will like this, but I personally think that all children will enjoy this. This could easily be your baby’s first toy, just to use as a noise maker and a soft night light to make your newborn sleep better, and a learning toy when they are older. Or, if you have a friend who is going to be having a baby soon, and you don’t want to get them the usual diapers and wipes at their gender reveal party, or baby shower, this would certainly make an interesting gift that is certain to please. Well made, constructed of high-end materials. 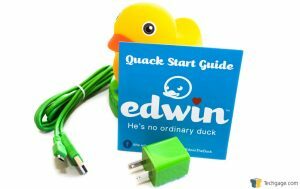 Edwin The Duck is available from Amazon via resellers, from the Apple store, or via Pi Labs’ dedicated website for Edwin. Be sure to pick up the companion App as well through iTunes for iOS or Google Play for Android.